An end! We have an end of sorts! Part Eighteen brings us to the end of the first draft postings of all 160-something devices in this Field Only Armoury Project I decided would be an amusing distraction and exploration of the SCA’s registered devices sometime back in early September. Part Eighteen And Last (for now…)! Click for larger, see text for details. This last-for-now batch is mostly quarterly, as expected given the alphabetical by blazon sort I’ve used, but includes a couple of nice vert-field devices right at the end. This includes one of the few canting arms in this project, Wade Greenwall’s splendid green wall device, “Vert masoned Or” on the right of the middle row there. Canting, for those unfamiliar, is punning or wordplay on a person’s name or a placename expressed in heraldry. The Swiss city of Bern uses a bear in their heraldry, for example. It’s harder in armory like I’ve been studying where there’s no central ordinary like a bear, but a few years ago in Atenveldt the good gentle Greenwall proved you can do it with field-primary heraldry too! Heralds, the ancient and terrible joke goes, do not pun. They cant. Happy Holidays, Merry Christmas, and Happy New Year to anyone who’s followed along this far, especially the awesome folks in the Facebook “Baby Heralds of the SCA” group who’ve provided so much great feedback and encouragement for this lunatic project. 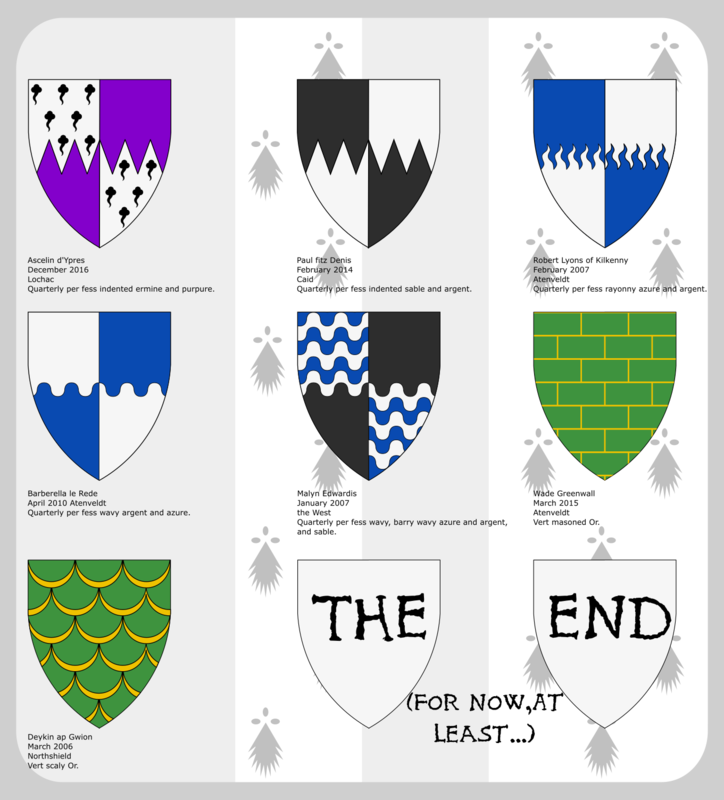 I’ll be working on updates and tweaks over the holidays and will be back in 2018 to finish it off with, hopefully, some style and some useful posters and such to share with the larger SCA heraldic community.